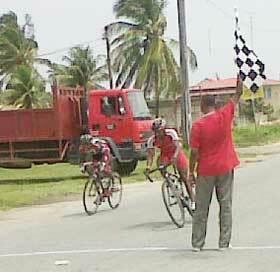 Robin Persaud emerged as winner of the third stage of the fifth annual Cheddi Jagan Memorial cycle race held on the Essequibo Coast yesterday. Raynauth Jeffery came in second, Walter Grant Stewart third, Orville Hinds fourth, Albert Philanderer came in fifth, while Junior Niles placed sixth. The 42 cyclist took off from Supernaam and raced to Charity and back to Anna Regina for the finish. Robin Persaud powers ahead of Raynauth Jeffrey to take the flag for the win. Walter Isaacs won in the veterans department, while Alfie Sonoram was the youngest rider to compete. Naomi Singh was the lone female cyclist. Organiser of the fifth annual Cheddi Jagan Memorial Cycle Race, Hassan Mohammed said the cyclists took part previously in two other stages previously; in Berbice, earlier in March, Ragnauth Jeffery was the winner, while in West Demerara, Paul DeNobrega claimed the second. Attending Sunday’s activity were Director of Sports Neil Kumar, Organiser Hassan Mohammed, Minister within the Ministry of Agriculture, Ali Baksh, Region Two Chairman, Parmanand Persaud, Vice Chairman, Vishnu Samaroo and other regional officials. Region Two Chairman Parmanand Persaud, first thanked the organizing committee, while showering praises on the cyclists, reminding them that are all winners in their own right. Minister Baksh, who said that the race was primarily in honour of the late Dr. Cheddi Jagan, President of Guyana, reminded the sports fraternity, that the late leader lived a humane life. He urged the sports enthusiasts to recognise the contributions of their leaders and to be responsible, while promoting spots in a positive way. Jagan he said had a passion for sports. Persaud’s whose win is the second in the series, concluded that it feels good.